Spring last year, I got a call from director Ruben Östlund who wanted me to do the filmposter for his new film, De Ofrivilliga. It was a great assignment, free, fun, a very interesting process to follow the development with the film and a greatful task for me reciving positive feedback from Ruben. When the poster was almost ready the film distributor decided not to go with the directors plan but to use a photo from the film instead. So the poster was never used, but as said, a very fun assignment. Click to see it bigger. The movie had premiere in november last year, we were there. It´s an outstanding movie, see it. What a shame... i think your poster is wonderful. Are each of those drawings by you? I love your poster. It has lots of identity! åh va fin den blev! Bad decision of that man. It's fantastic. I absolutely love the poster!its amazing..i agree with karin. bad decision! ameh!? alltså jag säger bara det. det räcker inte, jag sägert igen: ameh!? Synd och skam! Den är ju underbar. har varit med om liknande en gång fast bokomslag. trälit. man lägger ner tid o hjärta. den blev ju jättefin. Jag kommer ihåg att du tyckte det var svårt eftersom de ville ha ett visst maneer, och det har du verkligen lyckats med! a pity... your poster sure deserve to be picked in the end. It's fantastic! åh, vad synd. den här affischen var ju hur fin som helst! verkar ha varit ett kul uppdrag iaf, även om det slutade snöpligt. men som sagt, kalasfin! WOW. Grymt snygg. Synd att det inte blev den. Har inte sett filmen. Det skall jag. Måste jag. oh, i love this poster! you are brilliant. 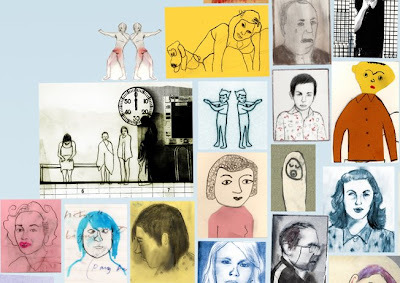 this reminds me of the post-it shows they have @ giant robot..
fliss, It´s all my drawings yes. msg, I´ll check Giant Robot out! that would have been a really outstanding poster - just an eye-catcher! You could put the poster for sale - it is so beautiful. Nämen såååååååå fin - kanon, bra super, orginell, överraskande och dekorativ...sååååååååå snygg!!!!! Men Du är ju hur bra som helst i alla fall! Oh what a disappointment! It looks fantastic and surely an image from the film is a bit obvious? your poster is amazing, i would actually probably see it just because i thought it had a cool poster haha. lucky you that must be amazing fun on both ends. Definitely a loss that this was not used. 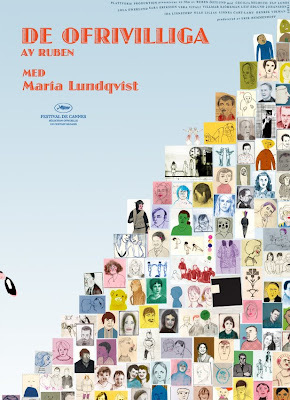 Such a wonderful poster and fun drawings. den är helt sjukt snygg, jag skulle gärna ha den hängandes på min vägg! Modern Craft, I may do that. ojdå vilket antiklimax. den var så fin. och hade verit rolgt med nåt annat än bild från filmen! it´s a really beautiful poster. great to see it here, even they didn´t understand to use it for the film. That poster is amazing.. and so unique. Thank you for sharing it anyway.. I know it can be hard to see great ideas that don't get used the way you had hoped. Jag har sett din poster här och var på nätet och jag måste bara säga att det är deras misstag. F-n vad snygg den är. Perfekt. I love love love your poster, it's incredible. What a shame they didn't use it, it's wonderful. Great poster, very creative and hand crafted, well done, and I love the pictures above the poster as well.